The 1996 Summer Games ushered in a population and business boom. 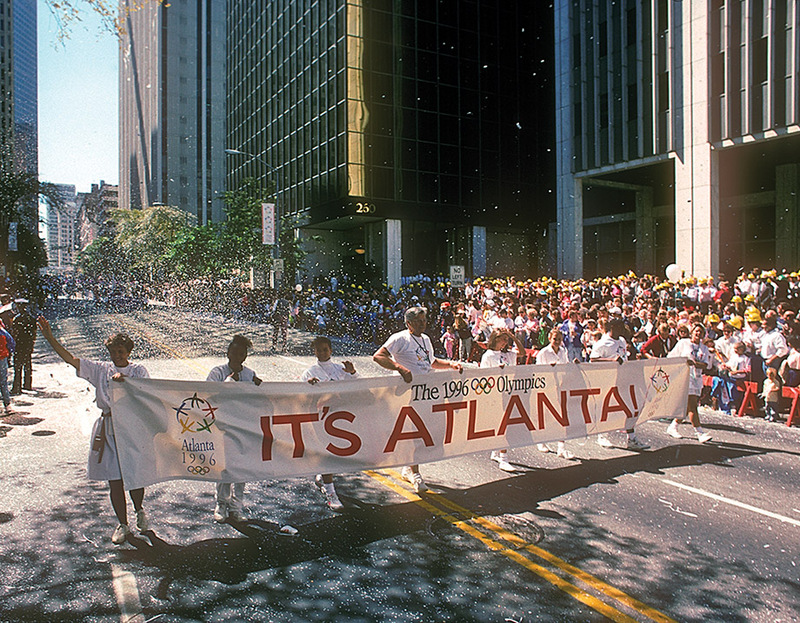 Between three syllables uttered on September 18, 1990, everything changed in Atlanta, and so did our city’s place in the world. That morning I tuned in to the live audio feed from Tokyo on my sleek black Panasonic alarm clock/radio/cassette player. A hush fell as Juan Antonio Samaranch opened the envelope with a rustle, like an Oscars presenter. For the next six years, the city anxiously and proudly fixed itself up for its world stage debut, and you can see geographic mementos today. Decades of wrangling with neighborhood activists ended when the state and city brokered a deal to build Freedom Parkway to the Carter Center, putting to rest a planned expressway. A patchwork swath of storefronts and vacant lots (goodbye, Club Rio) became Centennial Olympic Park. Public art rose, raising hackles. The only thing Atlantans agreed on was a loathing for the Olympic Cauldron, which we and national critics dubbed the Giant French Fry Box. Unlike Athens, Greece, the city considered a lock to host the Centennial Olympics, Atlanta had no ancient history, just modern ruins—neighborhoods near venues such as the Olympic stadium (now Turner Field) that had been long neglected. My job on the Atlanta Journal-Constitution’s Olympic team sent me to community meetings where two future mayors sometimes squared off: attorney Bill Campbell, then a glib, debonair city council member whose downtown district included major venues under construction; and former City Hall arts maven Shirley Franklin, the top female executive at the Atlanta Committee for the Olympic Games. Meanwhile, then-mayor Maynard Jackson was promising two pinnacles: the best Olympics ever and a shiny, better Atlanta. Would we be ready? That was the question that drove everything and everyone. Buildings and arenas were obvious deadline projects; a more unwieldy task was dressing Atlanta’s sprawling footprint, cul-de-sacs, and one-way streets in a uniform everyone would recognize as “the look” of the 1996 Games. For that, they turned to an old Southern icon, an enduring emblem of the cotton fields: a quilt. For our forested city, the design was a quilt of leaves, a box-and-vine design that adorned billboards, banners, tickets—even the medals. It inspired the design of Centennial Olympic Park and underpinned the city’s reputation for uniting across barriers of race, religion, and politics. This emblem suggested that Atlanta had connected its mishmash of ragged pieces for strength. We needed that narrative the second week of the Olympics, after terrorist Eric Robert Rudolph set off a bomb in the park, killing one person and injuring 111 more. When Atlanta gets burned, it’s in our DNA to rally and mend. The park reopened with a memorial service, and the Games marched forward. The park, stadium, and other structures are tangible artifacts of Atlanta’s two weeks in the international spotlight, but the real legacy of the Games is not found in brick, concrete, and circles of dancing water. The Olympics ushered in a population and business boom, doubling the size of the metro area and attracting a new, multicultural generation of Atlantans. At night I snuggle under layers of my own memories, sewn into a king-sized quilt made from my collection of Olympic T-shirts. In any other context, the bright interlocking-ring-patterned fabric from Olympic volunteers’ polo shirts would be downright ugly. I included a few Izzys, just to show my kids what a bizarre mascot Atlanta foisted on eBay. Southerners are collectors, and if you ask us what we kept from the Atlanta Olympics, you will discover boxes of pins (maybe even the rare interlocking onion rings from the Varsity) or strong dogwood trees, grown from the seedlings given to Centennial Park visitors at the post-Olympic reopening. These are symbols of our shared roots, when Atlanta was razing and rising during those extraordinary six years. Michelle Hiskey covered four Olympics as an AJC staff writer. She now serves as a senior editor at Emory University and contributor to the Saporta Report.